Palazzo Law Firm combines trial experience in personal injury and criminal defense law. Fresh out of Loyola Law School, Leo Palazzo was trying his first civil jury case — homeless man badly injured in substandard housing provided to local day laborers. It was a case no one wanted to touch. Stepping out on faith and putting up $90,000 of his own money, Palazzo felt sure he could prevail. With 25 years of experience and his two legal associates, Palazzo continues to set himself and his firm apart from the competition by combining the practice of personal injury and criminal defense law to best utilize their trial skills and their experience navigating the legal system. “If you’re truly a trial lawyer, you embrace cases dealing with somebody’s livelihood, health and freedom because those are the most important cases in the world,” he says. 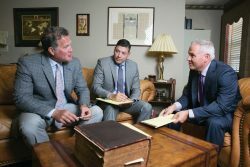 With the Palazzo Law Firm, you don’t just get one attorney — you get a team of attorneys. Palazzo says they roundtable every case and take on each one like they’re preparing for trial, regardless of whether they end up in court. That’s why it was critical for him when he added Jason Markey and Mario Arteaga, Jr., that they share his values and his tenacity for winning. Arteaga sees his clients as family, “And I want my family protected,” he says. He’s also set his sights on his church’s prison ministry to get more involved with youth and help change lives at an early age.